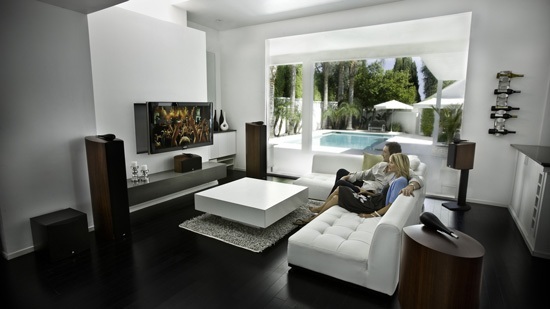 Your home theater experience will never be complete without the surround sound system in your living room. However, installing it is the most challenging part about this beautiful tech creation. Usually, people spend cash to ask assistance from others to install their sound system at home. But there are also companies who offer these services for free and other item movements in your living room to make the home theater experience more conducive. In the United States, Verizon provides furniture assembly including installation of speaker pair for their FiOS subscribers. But, if these services are not offered by your provide then here is an easy step-by-step procedure in mounting your home theater system. In a general setup, there is a total of 6 speakers including one center speaker, a left and right front speaker, two surround channel speakers, and the subwoofer. The speakers are illustrated below. Sound coming from both ends of the setup are highly localized and streamed directly to the listener’s ears. Level the height of the speakers to ear level while watching for a maximized viewing and listening experience. Also, both left and right speakers should be full range. Take note to not mount the side speakers and instead, ensure that the distance between the left and right relative to the center is equal. Placing them on stands will be the most practical way to set them up. The best possible locations of the center speaker include just above the television screen or mounted directly above the wall of the video source. As with most, aiming the speaker towards the viewers’ ear level will grant the best sound experience. This set up is the one being mimicked by gadgets such as Kindle’s five-antenna virtual surround sound or apps for upcoming iOS devices. A modest amount of two surround speakers is enough for a small home theater setup. Larger living rooms or private theaters could add four, six, eight or more surround speakers behind the viewing audience. The placement of the surround speakers will bring out the necessary depth in the audio playback. It’s no longer a left-right audio love affair, there’s also the back sound which is especially thrilling when watching action packed films, etc. Adding a back center speaker within six feet of the left and right surround speakers is a great idea, according to CNET.com. Subwoofers are complete loudspeakers and are famous for creating the wonderful low notes of the bass. Most available woofers on the market are floor mounted. What’s cool is that you can customize which part of your setup receives the low bass accents made by subwoofers. You can place them to complement the full-range speakers at the front. You can also set it up so that all bass sounds will come from the woofers, which they call bass management. Keep in mind that if you purchased those all-in-one instant home theater package deals, then you might be the one who will purchase the cables that will be used to connect all these. Although it’s really easy and doesn’t need anything more than common sense, make sure you buy the cables that will match the receivers and the speakers.